A really scrummy lemon cake, with a centre of slightly sweetened cream cheese. 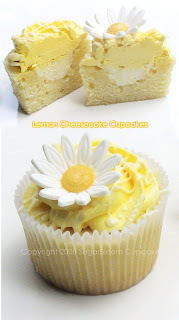 The whole cupcake is enswirled with a slightly tart lemon juice based mousseline buttercream then drizzled with melted white chocolate. ....It tastes EXACTLY how it sounds! Please ensure that all cold ingredients are allowed to come to room temp prior to baking. In a medium bowl, lightly combine the egg white, vanilla and one quarter cup of milk. Add the butter and remaining 3/4 cup of milk. Mix on low speed until ingredients are moistened then increase speed and beat for 1 and a half minutes. Scrape down the sides, gradually add egg mixture in three parts beating for 30 seconds between each addition. Scrape down the side to ensure even blending. Line 2 x 12 hole cupcake trays with bake papers and using a standard ice cream scoop, distribute the mixture evenly. Bake in a moderate oven for between 18 and 20 minutes Depending on the heat of your oven this may be more or less - do not let them over cook. Cakes will be cooked when they spring back lightly to the touch. Remove from oven and allow to sit in trays for about 3 minutes, remove from trays and allow to sit on a wire cooling rack until completely cooled. A little 'lemon yellow' food colouring paste as desired. Prepare a greased 1-2 cup capacity heatproof jug. In a bowl beat the yolks with an electric mixer until light in colour. Combine the sugar and water in a small saucepan (preferably non-stick) and heat, stirring constantly until sugar has dissolved and the syrup is boiling. Stop stirring and boil to the soft-ball stage of 115 degrees C (238 deg F). Immediately transfer syrup from saucepan to greased jug. Beat the egg yolk mixture continuously until COMPLETELY COOL. Add a little colour paste to tint the buttercream yellow. When cool, gradually add the butter followed by the lemon juice and zest. Place in an airtight container until ready to use. Sieve icing sugar to remove lumps. In a mixing bowl combine cream cheese and butter on medium speed with an electric mixer. Gradually add icing sugar and beat until combined, do not over-beat. Store in an airtight container until ready for use. Using a piping bag fitted with a 1 cm piping tip, pipe enough cream cheese mixture into each cake hole, level to the top of the cake. Using a clean piping bag and tip of your choice (I used a large closed star tip by Wilton) pipe on the lemon buttercream, starting from the middle of the cake making a swirl out to the perimeter. Melt some good quality white chocolate and drizzle over the top of the cupcakes. 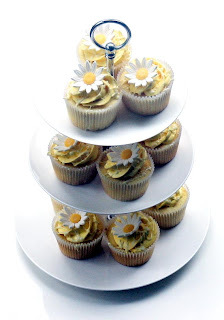 I made some pretty daisy type flowers for the top of each cupcake, but go ahead and place whatever you wish to the top of the cakes. Home made or store bought sugar decorations. Good Lord.......i NEED one of these!!!!!! Yum! I wish I lived in Perth & not in the middle of the United States. All of your cupcakes look & sound amazing! Where can we find the recipe for this? ?